The art of Chinese artist Li Xinping speaks to the language of rationalism. In his work, motifs, sequences, geometrics, mathematics, and dialectical oppositions orchestrate harmonious melodies, dancing on canvases, dynamic yet with restraint. Propositions bloom and transmute detailed and grand rendering into gentle touches and sober contemplations on truth, existence and the universe. The artist’s intuitive grasp of colour, aura and composition erase the boundary of time and space, as if the ancient philosophers are here with us gazing at the universe on a starry night. Together, they think and explore. Li Xinping’s work is an idealised machine in perfection and reminiscent of a zen monk in meditation. It’s both an equation and a guess. In his work, silence, vibrancy, art and science encounter a oil paint ground, with a common tool of creative imagination. 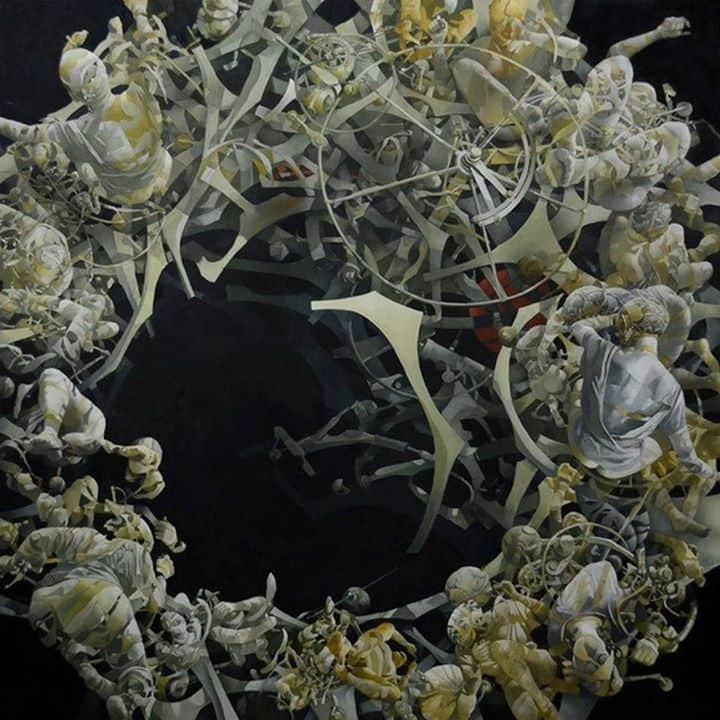 Li Xinping is a substantial thinker, and his work shows a steady range of development, over time his focus has shifted from a reliance on perception to rationalist elements as he progressed from painting objects and scenery in daily life to depicting geometrics and mathematical theories. A new angle to explore and question the existence of physical universe has emerged. Li’s sense of colour is derived from study of spectrum in the field of physics. His work constitutes a personal reflection of a dialectical opposition between rationalism and tangible experiences, here, on his canvas, art and science seems to have found something in common. Technology ventures ceaselessly with our time, or even ahead of our time, and our external world is ever enriching, while Li Xinping bravely explores the truth of existence. His struggle and willingness to experience defeat along the way is the direct source of his creativity.